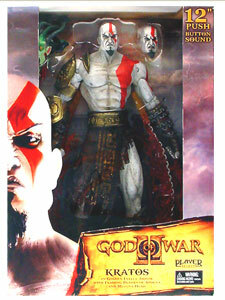 Description Of Item: Star of the Playstation game series God of War, Kratos comes with the Blades of Athena and Flaming Arches of Chain. This massive warrior action figure also features an alternate right hand holding the severed Medusa head with light-up LED eyes. Please note that the item inside the box is mint. The box is unopened however there might be some wear on the corners of the box.